The holiday sales are swirling everywhere and seasonal promotional ads grace the screens, rounding up our favourite giftable things (whether if it’s for someone special or for yourself), can still make things a little hard to narrow down. If you’re on the hunt for small gifts for that one distant relative of yours or for that one friend whom you’re forced to give a gift to, then check out our own list of Stocking Stuffers that you can snag this holiday. Kiss all you want under the mistletoe! This sleeping mask is made exclusively for keeping your lips well-moisturised. The Japanese apricot-enzyme helps skin cell turnover and removes dead skin cells. Apply an appropriate amount on your lips before heading to bed and check out the results the next morning! We’ve all had those lazy days when we get back home, sit by the edge of our bed and contemplate if going the extra mile to remove all the gunk off your face is worth the effort. Of course, we can’t help but to emphasise how important it is to remove all your makeup before you hit the sheets – which is why if you’re just as lazy as us, this Original Makeup Eraser is a definite lifesaver. 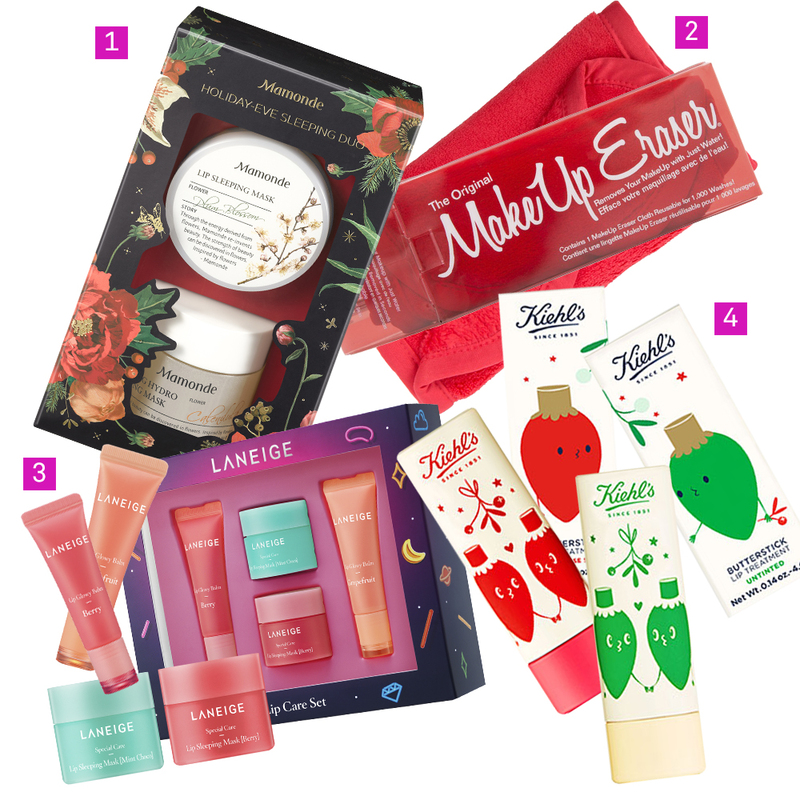 Get the perfect pout and pucker up under the mistletoe with Laneige’s Lip Care set. Theri highly coveted Lip Sleeping Mask now comes with a Lip Glowy Balm for you to swatch on during the day for shiny, smooth and supple lips. Goodbye chapped lips! You’re going to want heaps of this goodness. If you suffer from chapped lips, apply a layer and leave it overnight. With ingredients like coconut oil and wild mango butter, you can stop worrying about flaky lips. Not to mention, it smells amazing — like hot cocoa on Christmas morning. 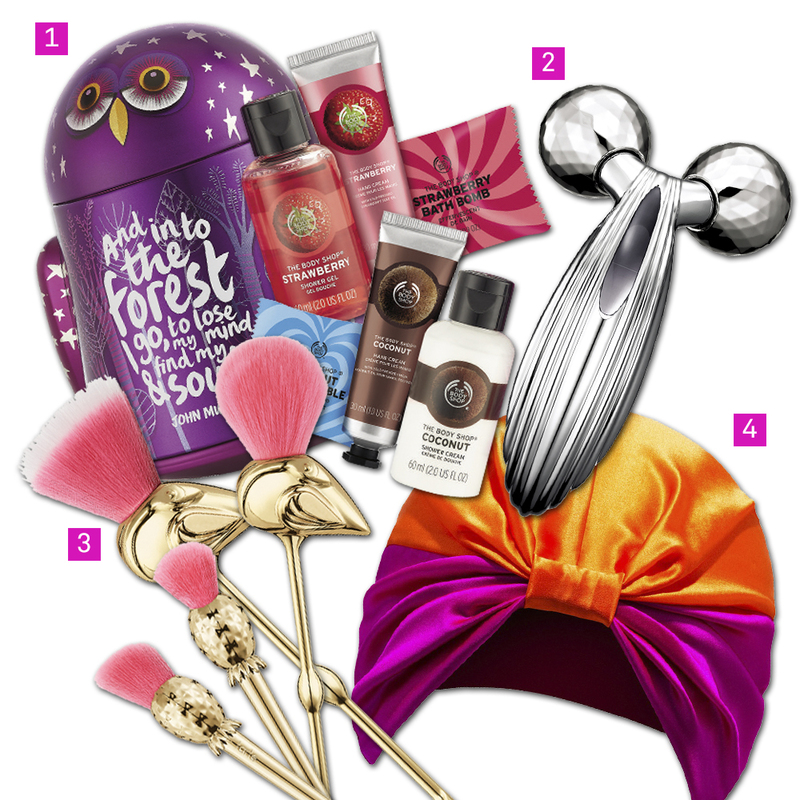 Packaged into a cute purple owl tin, The Body Shop’s gift set includes a bottle of shower gel, bath bombs, hand creams, and many more. Switch up your shower routine with these amazing formulas; lather up with a shower gel or watch your bath bombs fizzle. Smell good, feel good. The Refa Carat Ray Massager is small and handy — but it packs a punch. Featuring a wave-like pattern and streamlined body, this tool is great for precise and deep kneading. The solar panel in the center produces microcurrent and the rollers fit comfortably on every arch of your face. Stuff your face all you want this festive season, this is truly a Christmas miracle! One thing we love about Tarte is the fact that their products are all cruelty-free. These pretty brushes are super soft, with powdery pink bristles and glossy golden handles. There are 5 types of brushes — one for every part of your face. Full-sized and fun to play with, these brushes only cost $70, a great investment! Bad hair days? Not on our watch! Did you know wrapping your hair in silk actually helps to retain moisture and it makes your hair look less frizzy? This is ultimately the best gift you can get your hands if you know of someone who’s constantly waking up with a fro. A beauty junkie must-have! This chic set features two mini Voyager Caramel Melange Brushes and . a berautiful Caramel Melange Eyeshadow Palette that comes with a luxurious selection of six sinfully sweet shades to make your eyes pop! Need something to hang on your Christmas tree? Burt’s Bees Mistletoe Kiss Gift Set might just be the thing that you are looking for! The products in this set will brighten your lips and condition them, making them kissable. Enriched with Shea Butter, Vitamin E and fruit oils, there is no better way to pamper you and your lips. Why stop at one gift when you can have three! Give the gift of good skin with this Clarins set that features their Rehydration Mask, UV Plus Sunscreen and Water Lip Stain for a beautiful, natural look! Looking for a good night’s sleep, then this Big Bang Cracker from This Works is what you’re looking for. All you need is one spritz of this mini aromatherapy pillow spray and you’ll be off into the clouds! More of NYLON’s Beauty Gift Guides, coming soon — stay tuned! Click here to see our full list of gift guides.